I'm experiencing a strange issue with ReportServer Community Edition, as it seems to miss something (maybe dependencies?) and doesn't render any graph in report dadget HTML mode on dashboards. Could anynone help me solve this issue? Thanks a lot for your help! is this working on other browsers ? Yes, it seems to work good using Chrome. I'm not able to use Chrome in end-user workstations, though. And what type of dadget are you using? 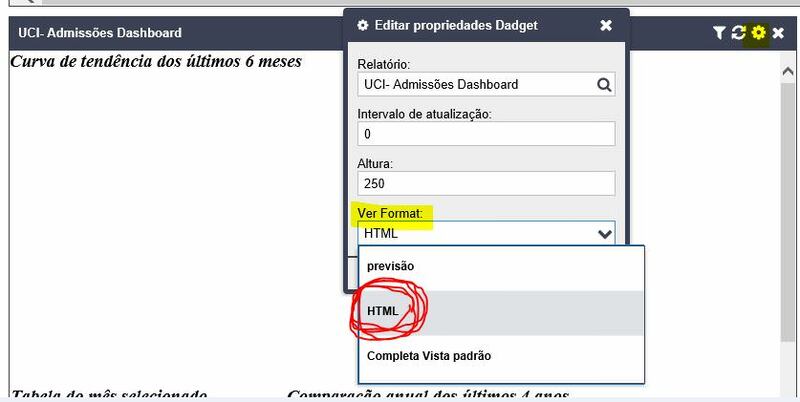 HTML ? Or saiku? What exactly do you mean by "graph"? Ok, so you are using a "report dadget" with the HTML format, correct? What kind of report is the report "UCI - Admissoes Dashboard"? Yes, report dadget with HTML format. This report "UCI - Admissoes Dashboard" was made using BIRT on Eclipse Neon. Please install in a test system since the demo data deletes all previous data in the system. Could you please try with this report ? For me, it worked. I'm using IE11 to render this, running in IE9 compatibility mode. ok, and does it work *without* the IE9 compatibility mode ? so if I understand correctly, all charts in your birt reports *NEVER* are shown in Internet Explorer 11, correct ? Yes, correct. All of them always show an error when I try to render using IE11 native mode. When I use "Compatibility Mode" to IE9 I get this strange behavior where these icons are shown instead of expected report output. Tried Firefox Portable, seems to render as expected using that browser. Any thoughts? Any news on this? Can anybody help? sorry for the delay. We are doing some testing. As soon as I have more information I will post it here. you are right, the HTML export of charts in BIRT reports is not working with Edge / Internet Explorer. We will take a look at this. I created RS-2799 for this purpose. On the meanwhile, why don't you select "View Format": "Complete Standard View" instead of "HTML"? This creates the standard pdf, which is shown in all browsers without any issue. Hello. Thank you very much for this update. Do you know if there are any plans on releasing an hotfix for this? we will take a look at this. Depending on the changes needed, this will be fixed either in a patch release or in 3.1 coming next year. This only affects dadgets in Internet Explorer. In the meanwhile, you can use the workaround, as I said, by changing "html" to "preview" in the dadget properties. The pdf shows the charts correctly. Hello. Any news on this issue? Thanks for your support. this issue is currently in the development queue. I will update here when I have more information.